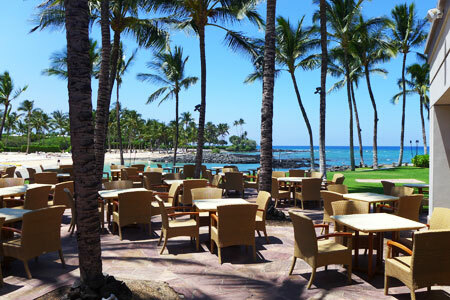 Open-air oceanfront restaurant offering an elegant setting and Hawaii Regional fare. : Located on the shores of the Fairmont Orchid, Hawaii, Brown's Beach House presents open-air dining with a white tablecloth setting and tiki torch lighting. Specialty dishes include the appetizer of char siu octopus, pickled mango, crisp rice and sesame oil; crab-crusted Kona kampachi with green beans, bacon, ulu and poha berry sauce; and seared Wagyu rib-eye served with baked Molokai sweet potato, truffled Puna goat cheese and red wine jus. Guests with bigger appetites may order the truffled bacon mac ‘n’ cheese. Save room for the Waimea strawberry malasada shortcake with vanilla ice cream. The extensive wine list offers Pinot Noirs by the glass. Live Hawaiian music fills the air on most nights.